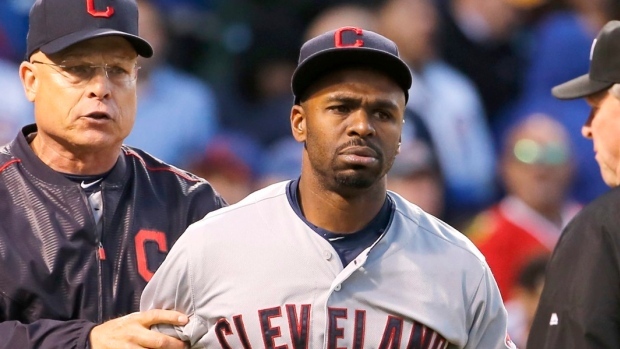 ATLANTA - The Atlanta Braves reacquired outfielder Michael Bourn in a trade Friday with Cleveland, also landing outfielder Nick Swisher while dealing third baseman Chris Johnson to the Indians in a swap of disappointing players. Cleveland sent cash to the Braves as well, helping cover the hefty contracts of the two players coming to Atlanta. Bourn was acquired by the Braves at the 2011 trade deadline and made the All-Star Game the following season before signing with Cleveland as a free agent. The 32-year-old is hitting .246 with 19 RBIs and 13 stolen bases. The 34-year-old Swisher, another former All-Star, is batting just .198 with two homers and eight RBIs. He is currently on an injury rehab assignment in the minors while recovering from left knee inflammation. Johnson lost his starting job with the Braves this season. He has a .235 average with two homers and 11 RBIs. Bourn is making $13.5 million this year, is owed $14 million for next season and has a vesting option for 2017 at $12 million if he makes 550 plate appearances the previous year. Swisher is under contract for $15 million both this season and next, with a similar $14 million vesting option in 2017. Johnson was one of the Braves' most surprising players after being acquired from Arizona in 2013, hitting a career-best .321 with 12 homers and 68 RBIs. That earned the 30-year-old a long-term contract with Atlanta. But Johnson's production dropped off significantly last season, and the team tried without success to trade him during an off-season makeover. He wound up on the bench and appeared in just 56 games, despite a rash of injuries. Johnson is making $6 million this year, is owed $7.5 million in 2016, and goes up to $9 million in 2017. He has a $10 million team option for 2018, with a $1 million buyout.